So, it seems that Payza has been completely removed from YGP..
My withdrawal from 2 days ago got reversed. The option to add funds through Payza is not available anymore, and I guess the same goes for withdrawals as well. Now there's only Bitcoin and Perfect Money as deposit options so we'll have to work with them I guess.. Yes, they are being pulled from most sites because even the Euro site is blocking entire countries. I don't think they will survive. I've improved the referrals extension selection script to include a calculation of the price to be added to the purchase balance just to prevent myself from doing the maths every time. You just need to set the first two lines with values based on your preferrence. 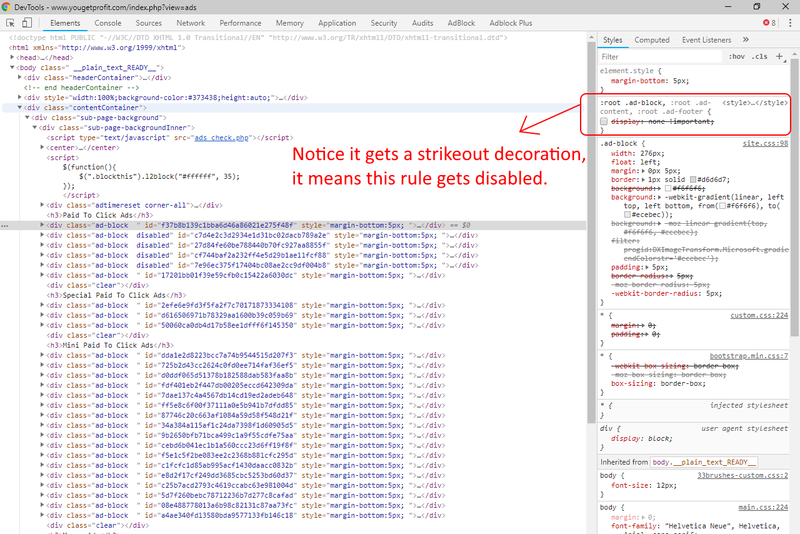 Then paste the script in the browser's console (display it by clicking F12) and press "enter". 39 RRs expiring in 2 days require $20.59200 to be extended. The script automatically selects all checkboxes based on your preferences set above. Only with this script you first need to sort your referrals list using the "last click" column (older dates should be at the top). 7 RRs that haven't clicked since 24-05-2018 require $0.35000 to be recycled. And again the script will have already checked them for you. Now you only need to select the recycle command. Lately I've been facing an adblock issue on YGP.. Even though I've disabled my adblockers YGP still doesn't show ads up.. So, I use the following way to display them. Right click on the "Paid To Click Ads" and select "Inspect". 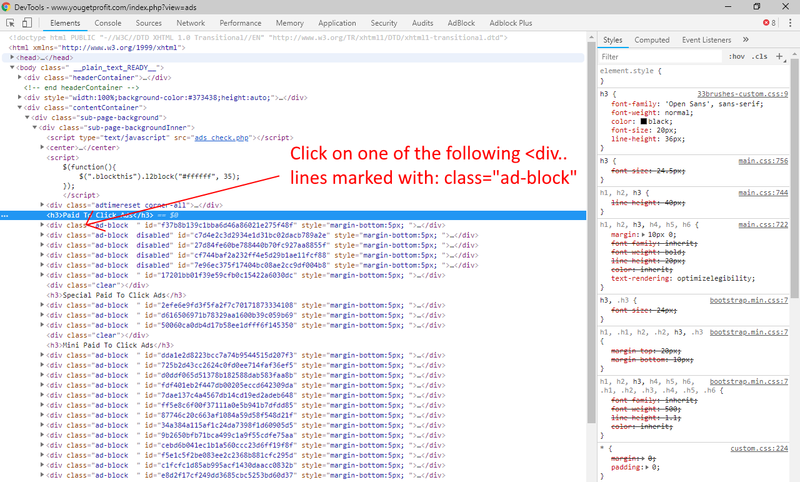 Click one of the following lines that start with "<div " and are marked with class="ad-block ". 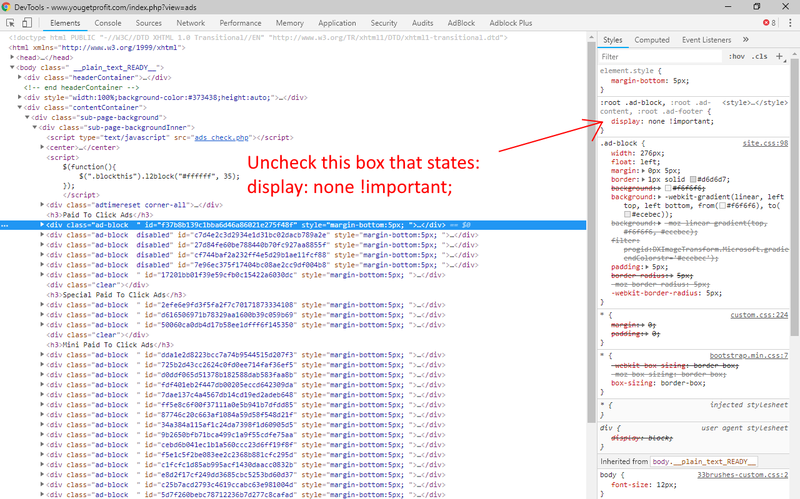 Find the rule to the right that starts with ":root .ad-block" and states: "display: none !important;" and uncheck it. The ads should now show up.. don't refresh, browse elsewhere or close the YGP ads page because you'll have to repeat the process. Just complete your ads clicking routine normally (Click ad => view it on new tab => close the new tab => click the next ad etc.). The process should be similar in Firefox or other browsers as well.. mobile browsers still don't support the developer console as far as I know. I've just spotted another interesting way to advertise R4A on YouGetProfit, that actually makes it worthwhile due to the high cost of $1.5 per 1000 visitors. I was interested in driving traffic to a Greek site I'm running, so I decided to check how much greek traffic YGP could deliver. So, I purchased 1000 credits and assigned 500 credits to a URL with a filter of Greek members only. Unsurprisingly only a few people from Greece click daily on YGP, however to my surprise there are a lot of people that click on those ads while not having registered on YGP at all. So, after 4-5 days my ad has received only 15 clicks from members but 168 outside clicks from non-logged in visitors. That's almost 10x times more than the actual credits I have spent so far. Now since all PTC campaigns are equally exposed to the same outside visitors it's not like I'm cheating the system.. it's just a matter of targetting and it is a good advanced tactic to get much more from our campaigns. It's just like the PPC banner exposure when using BoB where every impression counts (not click). I can guess we could use this tactic on other sites as well.. So, let's see how much we could benefit from it! That might be a good way to do it. Since you're not getting too many internal clicks with this ad, you may wind up with tons of external clicks by the time it reaches 1000 internal clicks. See how it goes. Well. With the text ads, it's pay per impression. Whereas in the method SS described, he could get tons of extra, external clicks. Could it have something to do with the time zone? I think the graphs are based solely on their own timezone, just like the rest of the site. I have a 2 hours difference with them, so the server reset time is at my 2am (winter time). Plus it only happens once a week which doesn't match a server time problem.. as it should happen every day otherwise. Just like when I miss a day's clicking the next day is boosted in RR clicks.. so that doesn't cost me a lot, but it shouldn't happen in the first place. I'll monitor to see if that happens the next week as well and I'll then contact them about it.